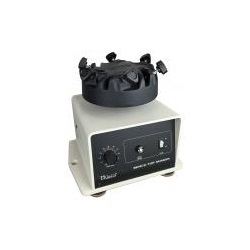 ·features a variable-speed motor that provides gentle, low-speed shaking to vigorous, high-speed shaking. ·features a built-in shaking head with easy-to-adjust knobs for quick loading. Six positions available. ·will accept a variety of glassware holders for mixing and shaking. ·may be placed inside a fume hood for added safety. Load Weight Capacity: Up to 20 lbs. Electrical: 6-ft, 3-wire grounded cord. Electrical Rating: 1.0A 50/60 Hz.